Forceful, dedicated, and brash, Sadie American shaped the National Council of Jewish Women for more than twenty years before resigning and severing all ties with the organization. In 1891, American joined the organizing committee for the Jewish Women’s Congress and called for the creation of the National Council of Jewish Women at the congress’s close. She was elected corresponding secretary of the NCJW and became executive secretary in 1905, essentially acting as the organization’s executive director and its spokesperson both across the country and abroad. She also took on leadership roles for a number of local Jewish and civic organizations, from the Maxwell Street Settlement House to the Women’s Club of Chicago to the Illinois Consumers’ League. Under American, the NCJW greatly expanded its reach and focused its mandate on social welfare and philanthropy. But over time, her strong personality and her controversial opinions on issues like changing the Sabbath to Sunday created tensions. While she was repeatedly reelected, she finally resigned in 1914 rather than face a constitutional change that would have severely limited the authority of her position. 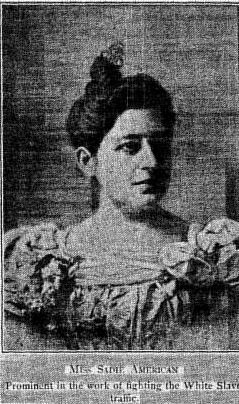 Sadie American was a driving force behind the National Council of Jewish Women. Jewish Women's Archive. "Sadie American." (Viewed on April 20, 2019) <https://jwa.org/people/american-sadie>.